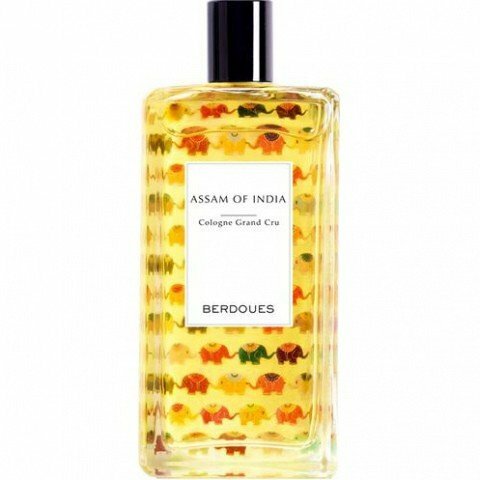 Collection Grands Crus - Assam of India is a popular perfume by Berdoues for women and men and was released in 2015. The scent is citrusy-fresh. It is being marketed by Groupe Berdoues. As a passionate tea drinker I am always interested in tea scents. So far I have only tested the Camelia chinois by Maitre Parfumeur and earlier a few Bvlgaris. The fragrance comes in a really pretty bottle printed with cute, colorful elephants, which I like well. When sprayed on, a distinct lemon note first appears, just like fresh lemon juice. Then comes a classic tea scent, black tea, unscented. Most likely really like fine Assam, no dark tea, no fine Darjeeling. The lemon flies away after a while, the black tea remains dominant, at the end a slightly mild note in the base is added. After sandalwood is contained in the data, I guess I guess on it. All in all : with the scent you get exactly what it says on it - fresh Assam with lemon. I can imagine it as a great refreshment in summer, for daytime in the office or during leisure time. Definitely nothing for the evening. While strolling through Kstadt, I discovered beautiful flacons, together with attractive boxes. Of course an emergency stop and first have a look - then sniff. All flacons are imaginatively designed - but the elephants top the pleasant sight. The eye not only eats with you - it also smells with you. And my nose won't be disappointed either. A mild, but spicy Assam teen note blows around me - transparent, but clear. That's how I like my tea - not too strong, yet aromatic. The citrus gives freshness, so one can think of summer iced tea, but now in winter, the Assam with a dash of lemon would also be welcome. Mysore achieves slight suppleness - without being directly creamy. Despite its mildness, the Indian elephant has accompanied me unchanged for hours - faithfully and harmoniously like its heraldic animal. An authentic tea scent, not only for tea drinkers, because it transports well-being and homeliness. Well suited for summer and winter. In German tea stores - most likely in others as well - I sometimes encounter tea creations with constructed phantasy names like "Beautiful evening", "Elixir of Peace" or "My partner just left me, lemme get something hot for myself" (not really, of course). Why do I mock that? Because I get the occasional impression that lower quality ingredients are meant to be up'ped in value by a mouthful of a name. I should add that with my two dozens cup of teas per year, I'm rather clueless than expert. But as someone who enjoys smelling the non-watered ingredients and sampled Masala Chai in Nepal, Holy Tulsi in India or green Gyokuro in Japan, the erman aromatized mixtures sometimes come across to me as perfumed potpourris. Oh, I'm absolutely certain that there are equally precious discoveries to be made here as well, I just lack patience and test volume. Assam of India combines the sweet quirkiness of a fresh Summer punch with the lively transparence of a sparkling water. The first minutes reveal orange calippo - anyone knows that retro water ice candy with its fizzy white pieces? - before the scent outgrows its childhood and positions the lemony-sweet citron with such a delicious flavour that it brings the corner of your mouths up in a smile. Its progress into base note is smooth to follow, uncomplicated and harmoniously blended. "Indian Tea"? I don't know ... the Assam tea that I digged my nose into was of a (great!) dark smoky seriousness, which I can't detect here in the slightest. Bright and in light-footed dance the tea note joins our lemon, without vanishing into glaring airiness like some other (usually non-black) teas that I had sampled. What my beloved "Vanille Insensée" is for vanilla fragrances, the base note of this Grand Cru is for tea fragrances; both colognes are elating souls of happiness. The sillage of about a meter comes closer during the day. Unlike several complaining voices among the German reviews, the scent stays with me well over a full office day. Maybe that's due to the season, as this January day can't bring much heat that would encourage both transpiration and vaporization. Surely this IS a classic water for Summer, however, in its cheerful clarity, I find it fitting throughout the year, given some sun and not too much humidity. Consequently, after testing 50+ fragrances with diverse tea notes, Assam of India skyrockets into my personal Top Three for this category. If you're interested in others of my highlights, I invite you to try "Myrrhiad", " Yu S?n", "Armani Privé - Figuier Eden", "Paco", "Menthe Fraîche". In spite of many black teas in my test series, to my own surprise the fresher creations seem to have easier chances of winning me over. I react too sensitively to the smoky kinds and even the expensive Jo Malone series with its Rare Teas passed me without much passion. Two small points for criticism remain: Next to the only moderately fitting name, it's - of all things! - the flacon with its cute elephants, not because of the design but because of its size. 100ml is simply to much for me. But that's hardly an argument against the fragrance, so I leave this with a warm ... no, fresh recommendation!